Are smartphones making us smarter? The smartphone is the reality and requirement today. Kids and adults are all plugged into the digital world one way or another. Neither running away from technology help nor can we let them enter our personal space. But are they making us smarter? No, they are making us handicap! The biggest drawback of cell addiction is depleting family time. Technology has turned into a bigger distraction than a family bonding adhesive. Assuming all four members are present in your family yet, they may not be physically present, all thanks to the virtual world drama. Recently, apps like Bit Guardian Parental Control have gained popularity to cut down kid’s cell phone addiction and connect them with the real world. Is Social Media Running our Social Skills? Social media is creating a bunch of antisocial and unhealthy people. Social media has started controlling us rather than us controlling social media. How? The best answer to this is the number of likes on your recent picture gives more self-validation than the number of people who remember you during your sickness. Isn’t it? Social media is running our generation in ways we don’t know. It is an alarming situation because it is impacting the real-life relationships. Social media is severely persuasive. At one point in time you are checking your cousin’s wedding pictures, and the next thing you know you are browsing through your favorite clothing brand. There is no stopping in social media! Now, imagine, how distracting social media can be for the young folks. What is a Smartphone doing to the Kids’ generation? Technology harms us in so many different ways without our knowledge. Funny thing about technology is- Cure one effect of technology, and the cure creates a new side effect. Don't you agree? They say, “Health is Wealth,” and we see “Technology is wealth” But the sad part is, technology is only killing our health. 90 % of members in the family use digital gadgets, and we can say with confidence that 90 % is about to or already are victims of technology-driven health issues. The more technology creeps into our lives, the more medicines we purchase. Right from adults to kids, postural problems and eyesight issues are common. Once in a while, you may hear about the malignant effects of mobile phones which implies that we cannot take our health causally. We all can witness how cell phones are killing face to face interaction. Every other individual on the street is engrossed in liking a picture of a celebrity on Instagram who they barely know. While the guy who travels with you every single morning in your bus may be an entertainer but wait, you never cared to speak. Our intention is not to encourage kids or anyone to befriend strangers. The idea is to increase our real-life social network and nurture existing relationships instead of creating a fake world of virtual friends. Did we mention technology is making us reliant and dependent? I hate to break the news; it is! Most of us are excessively depend on technology assistances like calculator, maps, auto correct, cameras (to click every information we cannot remember), etc. Our cognitive capacity is depleting gradually. The more reliant we are on technology, the faster the brain gets dimmer. Seeing the trend with the millennials today, the day is not far when kids will completely forget how to read maps and calculate mentally. Logical and analytical thinking is the food for our brain; don’t deprive it of its nutrition. Comparison with other friends and relatives makes our mind anxious and depressed. A small reality check: There is always going to be someone better than us. So, what’s the point of feeling bad? However, that’s what social media is doing to us. We all are losing sleep, happiness, and peace of mind thinking of what all we are missing! 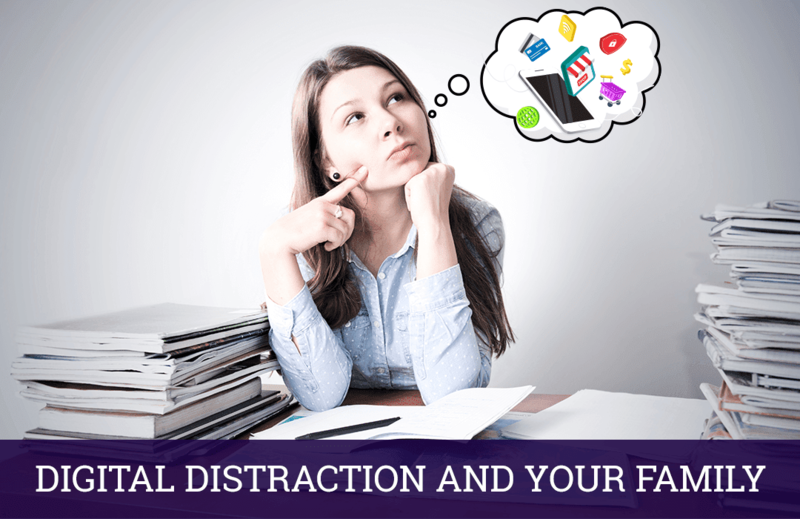 How can you Prevent Digital Distraction during Family Time? 1. Fix a Family time-the first step is to set a family time daily. Make it a point to keep those gadgets away when everyone congregates. Discuss your day and positive episodes from life to ensure kids enjoy the family hour. Believe it or not, hearing your kids out improves the rapport with children. 2. Fun activities with Kids- If you miss playing soccer or tennis, then stop regretting and hop on with your kids. Enjoy their play time and see the magic brewing in your relationship. 3. Eliminate phone at a specific time- Haven’t you heard doctors say – Eat your meal peacefully! Avoid having gadgets around during dinner time. Instead, engage with your family members and LISTEN to their stories. 4. Get rid of unnecessary apps- We all have pointless apps in our gadgets. Why not get rid of the apps and use the browser version whenever required, this is equally true for all the gaming apps that distract kids. 5. Limit kids' screen time- There are plenty of apps in the market to assist you with limiting screen time which promises kids' complete attention to your dialogues and activities. 6. Be a good example- There is no replacement to being an excellent example for your kid. He/she will take away all the brilliant mannerisms that you showcase. Pick up a classic and see how your kids start cultivating the habit of reading. Trust us, it works! What Age Should a Child get a Smartphone? Well, age is a relative term and varies from child to child. You are the best judge to analyze your kids’ maturity and sense of responsibility. Once you are confident, your kid is showing green signals, hand over a basic phone to test his reaction. Slowly and gradually, move to a better version of the cell phone. However, parents should not give the leash in children’s hand. Identify a parental control app like Bit Guardian Parental control and keep the remote control of the cell phone in your possession. The idea behind parental control app is simple- use the cell phone only for needs- if there is anything more significant, consult the parent. Go ahead and get your family time back. Invest your time and energy into family activities while Bit Guardian Parental Control app helps in digital parenting.